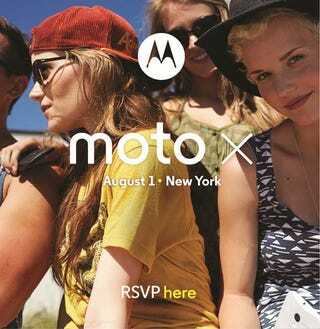 Motorola&#39;s going to show everyone the new Moto X on August 1, in New York. Motorola's going to show everyone the new Moto X on August 1, in New York. Or well, actually, it showed us the phone right there on the invite, on the left. May as well give up all pretense of these things being some big surprise. We'll tell you more about the phone from the event.